Just learned something new. Hum ...you would say that is usual, what is new ???. Agreed. As we are talking internet, web applications and cloud appliances, we are reaching out to different services for various purposes like managing social contacts, emails and calender as well as online banking, ticket booking, shopping etc. For each of these purpose, to maintain privacy and security, we have individual registration to each of these sites and we merrily remeber all those user id and passwords with certain security questions ( Identities ) . Some sites now a days trying to give some relief of identity maintenance and provide alternate security mechanism like open id, google login, facebook connect and so forth. Well, what I have learned today is about identity and how Windows Live manages it through Information Card. Here is an excerpt from Microsoft about Information Card. Information Cards are downloadable digital certificates (An attachment to an electronic message or transaction that is used for security purposes. The most common use of a digital certificate is to verify that a user sending messages or information is who they claim to be and to provide the receiver with the means to encode a reply. Digital certificates are issued from a certificate authority.) that enable you to sign in to Windows Live ID sites and services without a password. Once these certificates are installed, you can sign in to multiple sites and services without needing to remember your Windows Live ID (The e-mail address and password that you use to sign in to Windows Live programs and services such as Windows Live Hotmail and Windows Live Messenger; Microsoft services such as Xbox LIVE, MSN, and Office Live; and anywhere else that you see the Windows Live ID logo.) and password combination. To use an Information Card, you must have Windows Internet Explorer 7 and Microsoft .NET Framework 3.0 installed on your computer. If you don't have the correct version installed, you'll be prompted to download and install them before you can associate an Information Card with your Windows Live ID. You can also use Windows CardSpace to manage your Information Cards. These information cards are basically digital certificates and would be managed by Windows Cardspace on your devices. These digital certificats are interesting in a way that these has been been targed for much more higher purpose than just identifying a single user on pleathora of Microsoft windows live services. Well, there are such text to voice softwares out there. Also there are softwares which can convert your voice to text. 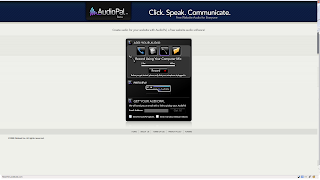 I have come across this cool free online utility "AudioPal". This allows you "free" to convert your text to speech or to record a voice. You have four different methods to input that textual thoughts of your to AudioPal. You can go AudioPal website and click to get to AudioPal Editor. The recorded message can be previewed right on the editor. The recorded message would be forwarded to you using an email which you will have an opportunity to share. This is one of the cool option. This is again couple of simple steps to reach to get your text recorded in speech. Type your 600 character text message. Choose in which language you want to record this text message. Then you can select whose voice you want your text message. That is it. You are ready to get your text message in different language and various voices.Rest is as it is. Preview and provide email to pick up your AudioPal message. Simple. Record, preview and provide email to pick up AudioPal recording. That's it. Just upload the file, follow the instructions and get your Audio in email. After you receive an email, it will have a link to pickup a widget code for AudioPal entry you have made. There are lots of social sites to which they provide the sharing code. Latest Update: Google Wave is been donated to Apache and currently it is in incubation state at Apache Wave. I have received an invite to preview Google Wave. Happy and glad to be part of Wave community. And would love to share my first look of Google Wave. In case, you would like, I may send an invite nominate you also. Please let me know if you are interested to preview Google Wave. First important thing, I have observed, after logging in using my existing Gmail id to Google Wave, is a screen which has three panels and one blank panel for opening/creating new wave. Well, I do not want to stretch your curiosity, please find attached screen shot from from Google Wave opened using Google Chrome. A "wave" is equal parts conversation and document, where people can communicate and work together with richly formatted text, photos, videos, maps, and more. Google Wave depends on strong JS and DOM rendering performance to provide a desktop-like experience in the browser. HTML5's offline storage and web workers enable to use desktop like features without compromising on performance. The Google Wave protocol is the underlying format for storing and the means of sharing waves, and includes the "live" concurrency control, which allows edits to be reflected instantly across users and services. The protocol is designed for open federation, such that anyone's Wave services can interoperate with each other and with the Google Wave service. I have received a new email id with "GoogleWave.com" domain id. I can open Google Wave in FireFox 3.5.3 correctly. IE 8 has extension mark for moderator.appscout.com panel. As Google advises on Google Wave Development blogsite they will be extending the preview for IE 8. To utilize Google Wave in IE 8, they expect IE 8 user to install Google Chrome Frame. In regular Google tradition, there are lots of videos on Google Wave, Google Wave APIs, Google Wave Extensions etc topics. Install extensions for rich contents and integration with other systems. Of course you can spell check your wave. Google Wave API and Google Wave Extensions/Gadgets are some of the topics, I am curious to know in more depth. Co-create an itinerary: choose points of interest -- including Lonely Planet recommendations, organize, share, print, or export to My Maps! This one is my favorite. It allows my wave visitor/reader to choose a response like "Yes/No/Maybe". Isn't it awesome. It is written by Google. Allows developers to create new Extension Installers. You can find more extensions here. I am positively impressed with the tool. I appreciate the gracious sanction of my request to get me in Google Wave review to experience before lots of other cool nice people around. From my perspective it is the rich online collaboration tool which allows to perform all those things what MS Outlook and other desktop email + collaboration tools allow you to do. From my perspective, we are observing the rise of groupwares in Virtual World like we have used Lotus Notes, Outlook and such tools. I see tremendous value and potential in extensions and integrating Google Wave to manage my all contacts, related social media relation ships and various artifacts. I am in a situation like any young child who is been presented with a new toy, how excited he/she with toy and try to figure out what games could be played with it. Hopefully I would figure out more and more interesting things from Google Wave. Seems like this virtual social blogsphere has intuition of its own. After I have posted my curiosity about Google Wave use cases in front of the world, I have found this very interesting blog post titled "Google Wave's Best Use Cases" from LifeHacker.com. I have found out that SalesForce.com and SAP's research lab are early adopters of technology and are working on a Google Wave extension that facilitates real-time, collaborative development of business processes. After I have submitted Google Invite for my precious and important visitors, I have received this message from Google Wave. Google Wave is more fun when you have others to wave with, so please nominate people you would like to add. Keep in mind that this is a preview so it could be a bit rocky at times. Invitations will not be sent immediately. We have a lot of stamps to lick.